Spinning spirals dance to the melody of art in an innovative design from Saifon. 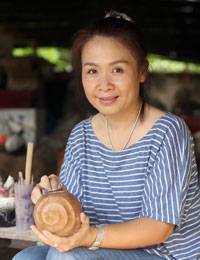 She carves the mango wood vase by hand, expertly evoking the dynamic patterns that render this vase unique. 35.5 cm H x 17.5 cm Diam.